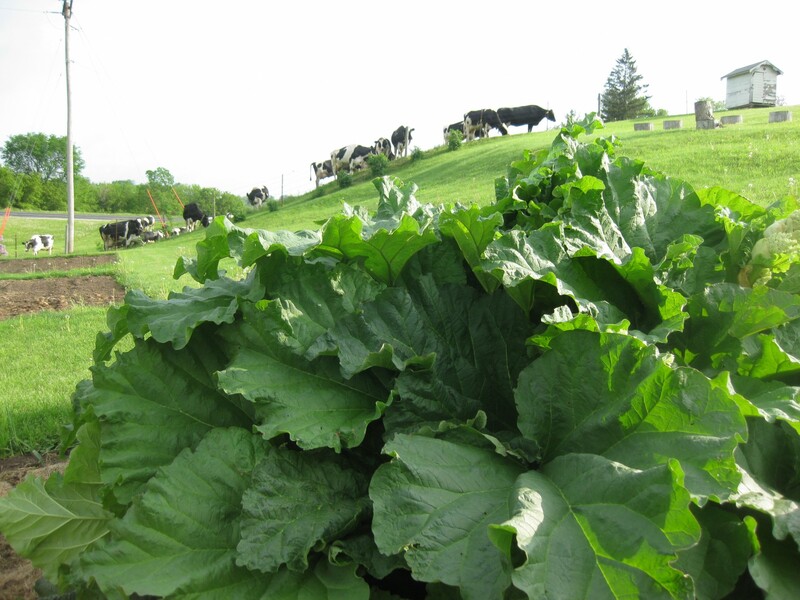 We are blessed at Amil’s Inn Bed and Breakfast to have a luscious rhubarb patch that provides rhubarb for many of our favorite desserts. We would like to share a couple of our favorite recipes with you. 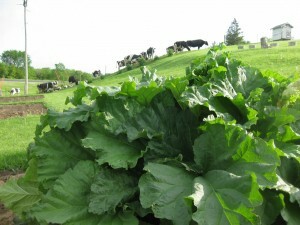 Bumper crop of rhubarb at Amil’s Inn Bed and Breakfast! Empty the cake mix in a glass cake pan and then pour the chopped rhubarb over dry cake mix. Sprinkle the sugar and then pour the cream over the rhubarb. Sprinkle with cinnamon. Bake at 350 degrees for about 45 minutes. This recipe is so easy to assemble and fast to make. You will want to make this recipe several hours before you serve to allow the cake to set before you cut. This recipe came from my friend Tracy Baird in Sparta, WI. Cook rhubarb in water until tender; sweeten with honey and sugar; Cool; Puree in blender. Prepare Jello as directed on package and chill until almost set. Remove from refrigerator and add pureed rhubarb and vanilla ice cream. Beat thoroughly. Place mixture in pre-baked pie shell and refrigerate until firm. Makes one 9 inch pie. Optional: Slice a few fresh strawberries on top. Also, strawberry ice cream can be used instead of vanilla ice cream. We at Amil’s Inn Bed and Breakfast hope you enjoy these recipes as much as we do.